Published in the Shortlist section of The Sydney Morning Herald, Feb 19. 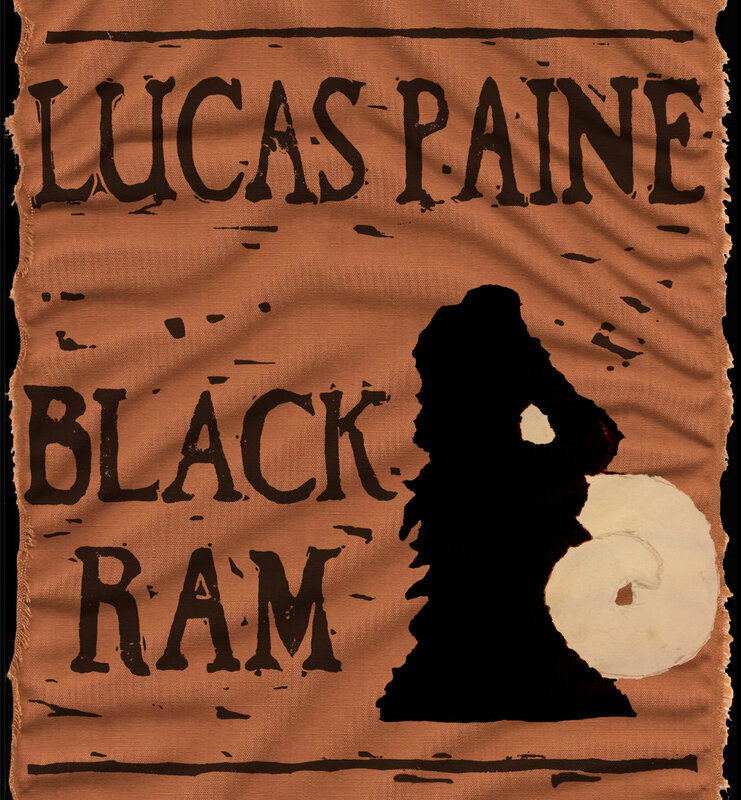 With his fifth release, Melbourne-by-way-of-Virginia artist Lucas Paine has stripped it back. Way back. In an effort to channel the simplicity of early folk music, Black Ram bears only Paine’s banjo and guitar, his voice, minimal accompaniment – a far cry from his last cut, which while sparse and spacious, swelled with a warm fullness. Not to say these songs aren’t effective. While a couple are let down by Paine’s voice, which doesn’t seem as solid as it’s been previously, they’re strong in their simplicity, their basic form keeping true to their inspiration, coming together to create what is a mournful paean to life lived and lost, what true folk music is all about. There’s more than a nod to country music inherent to Paine’s music as well, his upbringing in wide-open, ‘big sky’ parts of the US obvious in the odd twang here and there, the way he phrases his music. Where Paine shines though is in his songwriting. Not going for overtly vivid imagery, his strength lies in the simple and true; you feel the honesty seeping from songs like ‘Black Ram Shuffle’ and ‘Wings Of Rusty Knives’. He cuts to the quick, the results taking you back in time. Published in Shortlist section of The Sydney Morning Herald, Friday February 12. 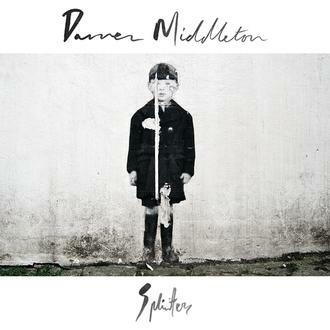 Powderfinger guitarist Darren Middleton has long since emerged from his former band’s long shadow and can now be classed as a solo artist in his own right, as he releases the second album under his own name, following up from his initial post-Finger release, Translations, in 2013. Splinters is an eclectic beast, to say the least. Dark, electronic tracks like ‘Right Here’ sit alongside wavery, folk numbers like ‘Unless You Want Me To’. 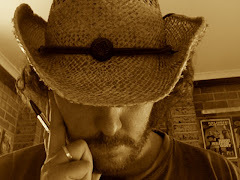 A touch of country permeates tracks such as ‘Farrows’. Trademark Powderfinger pop/rock makes an appearance. And it all seems to work, coming together as a collection of songs that while differing in style, are united via Middelton’s velvet vocal and his tight, poignant songwriting. A slew of female vocalists make guest appearances, including fellow Brisbane artist Sahara Beck (one to watch in her own right), Missy Higgins, Mia Wray and Kelly Lane, all contributing fine harmonies, which add a nice bit of colour. This is a mature record, one which marries Middleton’s experience with his relatively newfound freedom on an album where he’s not afraid to explore, sometimes within the one song, which does little to dull its quiet allure. Published as the cover feature in The Music (Sydney), Wednesday February 3. It’s Australia Day when Jess Pryles skypes in from Texas. It’s quite coincidental, given Australia’s national day (whether you agree with what it represents or not) is traditionally given over to all things beach, beer and BBQ – BBQing being what Pryles is all about. However, that’s where the coincidence ends – for we’ve not arranged to chat on this particular day about the Australian way of BBQing, far from it. This chat is focusing on American BBQ, southern BBQ, Texas BBQ. 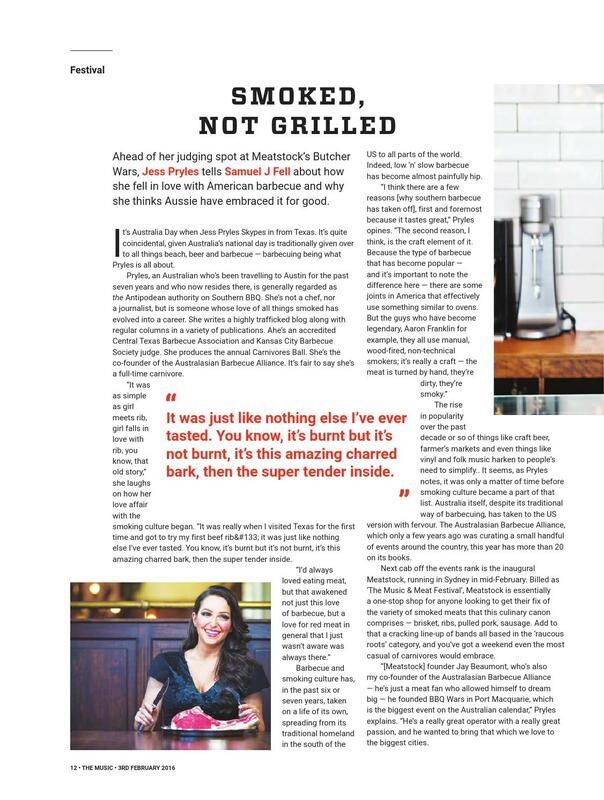 “Yeah, we’re talking smoked, not grilled, which is generally how Australians know BBQing to be,” she says with a smile. Pryles, an Australian who’s been travelling to Austin for the past seven years and who now resides there, is generally regarded as the Antipodean authority on southern BBQ. She’s not a chef, nor a journalist, but is someone whose love of all things smoked has evolved into a career. She writes a highly-trafficked blog along with regular columns in a variety of publications; she’s an accredited Central Texas BBQ Association and Kansas City BBQ Society judge; she produces the annual Carnivores Ball; she’s the co-founder of the Australasian BBQ Alliance – it’s fair to say she’s a fulltime carnivore. “It was as simple as girl meets rib, girl falls in love with rib, you know that old story,” she laughs on how her love affair with the smoking culture began. 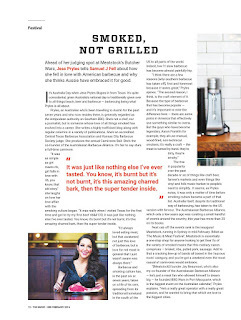 “It was really when I visited Texas for the first time and got to try my first beef rib… it was just like nothing else I’ve ever tasted. You know, it’s burnt but it’s not burnt, it’s this amazing charred bark, then the super tender inside. BBQ and smoking culture has, in the past six or seven years, taken on a life of its own, spreading from its traditional homeland in the south of the US to all parts of the world. Indeed, low ‘n’ slow BBQ has become almost painfully hip – it’s not uncommon at any of the many BBQ-related events around the country these days to be inundated by crowds of hillbilly-chic; check shirts and beards and trucker caps. “So just like we got into craft beer, or craft beard lotion or whatever, it’s just caring more about smaller businesses producing items with more care by hand,” she adds. The rise in popularity over the past decade or so of things like craft beer, farmer’s markets, and even things like vinyl and folk music, harken to people’s need to simplify, to go back to things that originally, were about care and love, things which offer comfort in their downhome-ness – it seems, as Pryles notes, it was only a matter of time before smoking culture became a part of that list. Australia itself, despite its traditional way of BBQing, has taken to the US version with a fervor. The Australasian BBQ Alliance, which only a few years ago was curating a small handful of events around the country, this year has over twenty on its books, testament to the culinary method’s growth. 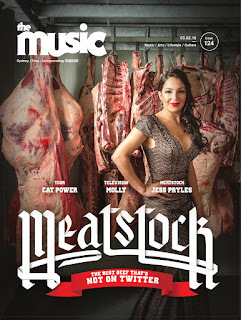 Next cab off the events rank is the inaugural Meatstock, running in Sydney in mid-February. Billed as ‘The Music & Meat Festival’, Meatstock is essentially a one-stop shop for anyone looking to get their fix of the variety of smoked meats that comprise this culinary canon – brisket, ribs, pulled pork, sausage. Add to that a cracking lineup of bands all based in the ‘raucous roots’ category, and you’ve got a weekend even the most casual of carnivores would embrace. 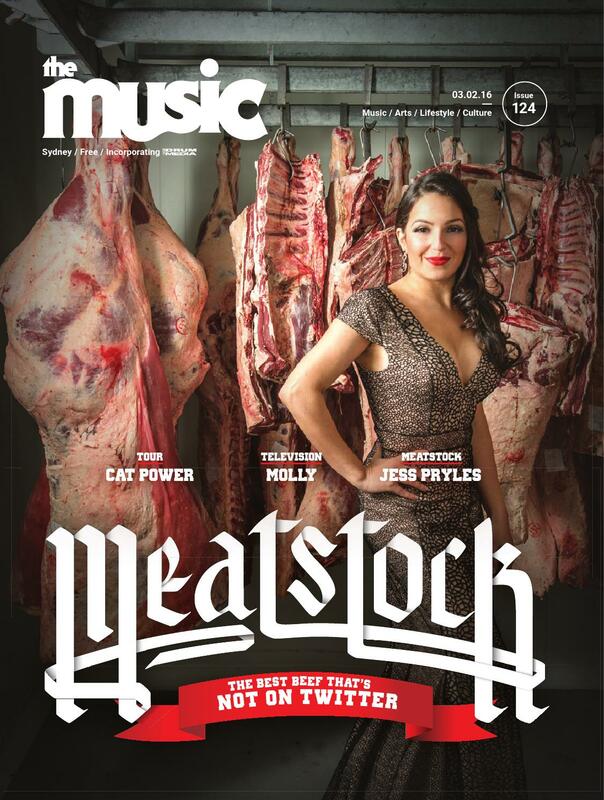 Meatstock is, to employ an overused term, epic. We’re talking BBQ Wars (essentially an amateur BBQ-off); Beard Wars (15 amateur barbers, chosen via Instagram, going head-to-head onstage); Butcher Wars (59 butchers who have a set amount of time to break down half a saddle of pork and half a lamb – Pryles is a judge for this particular War), along with an Expo showcasing the best in the culture’s accompaniments – smokers, dry rubs, hot sauces, meat producers, clothing. Plus there’ll be enough smoked meat, cold beer and American bourbon to satisfy everyone. Epic indeed. 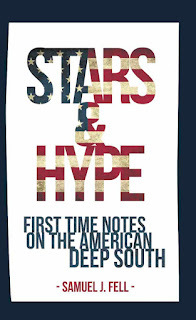 The size and popularity of events like Meatstock are testament again to the popularity of this culinary art, although it remains to be seen if it sticks around outside of its native Carolinas, Texas, Memphis and Kansas, whether or not it’s just a fad, albeit a reasonably long-running one. As we finish up our interview, that quintessential smell of charring sausages drifts from next door’s Australia Day party through my office window, and I can’t help but hope this is true – Aussie BBQing is one thing, but low ‘n’ slow smoked meat, US-style, well that’s just something else.